Professor Jamie Seymour catches an irukandji jellyfish about the size of a fingernail. A SURGE of people receiving irukandji-like symptoms has sparked a search for the deadly jellyfish. The search, conducted at the weekend, aimed to confirm if it really was the Irukandji jellyfish responsible for the series of incidents. Since December 22, 10 people have fallen seriously ill as a result of a jellyfish encounter while swimming in waters off Fraser Island. All these cases happened on the western side of the island. James Cook University associate professor Jamie Seymour arrived at Fraser Island on Friday to go irukandji hunting. His catch occurred 30m off the western coastline. Holding up his finding in a glass jar, the barely visible irukandji jellyfish is about the size of a fingernail. Prof Seymour said the find was almost expected to him. "I'm not surprised at all," he said. "I found one here ten years ago too, but the tourism industry said I had no idea what I was talking about. "And I was warning them for ten years before that too." 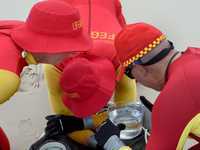 On Saturday, a group from Surf Life Saving Queensland arrived to begin their own search. Using marine stinger drags, which are like nets for jellyfish, they searched the areas where people suffering the severe symptoms were stung. Their findings were in contrast to Prof Seymour's. SLSQ chief operating officer George Hill said they didn't find anything of mention. "We didn't find a single specimen," Mr Hill said. 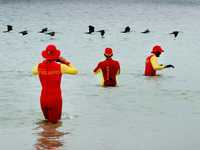 As the crew trekked the water in fully-protective gear, Mr Hill said they picked up everything in the way. "The drag would have caught them for sure," Mr Hill said. Follow Annie Perets on Twitter to keep updated with local news. A natural variable that could have interfered with the findings is that on Saturday, the wind was swinging to the south. 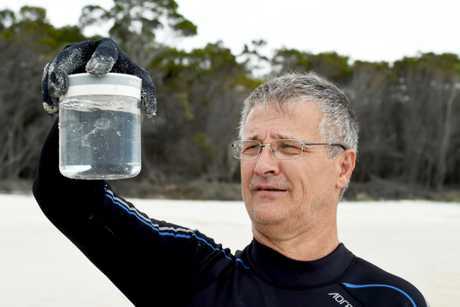 "If there were to be irukandji here, they would be more prevalent when it's north-easterly wind," Mr Hill said. "We are thinking there is a possibility we could come back later in the week when conditions are better." The waters on the west side of Fraser Island are predominantly used for boating, and it's those recreational users that are often victim to the jellyfish stings. Mr Hill said if the jellyfish Prof Seymour caught was found to be the the deadly sort, effort would need to be put into educating the public. 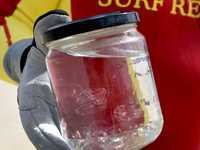 "Different irukandji jellyfish have different level of severity (in their sting)," he said. 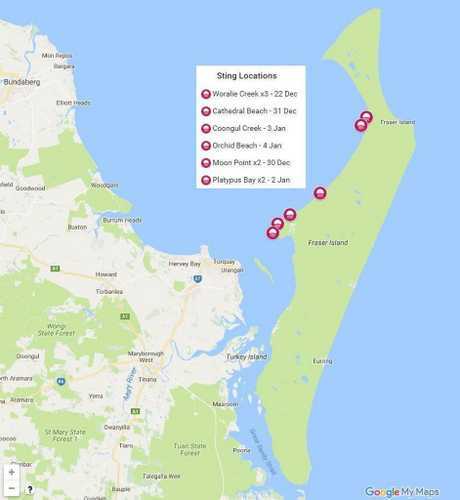 "The irukandji-like stings have become a regular occurrence on Fraser Island from December to January, and people now need to be aware that the danger is here. "For example, they are very prominent in the waters up in Cairns, and though people do get stung, it's not as many as you'd expect because people are aware that they are there." Mr Hill said a good step to being protected from the jellyfish is to wear a wetsuit to keep your body covered, similar to how the Surf Life Saving Queensland members were protected while treading through water on their irukandji hunt. "You've just got to watch out for the parts of your body that are left exposed," he said. "If you're stung on the face/lips/eyes/neck area, that's where the effects are the worst. "We often see this when people are wearing no face cover and snorkelling." David Olds has Camped on the Western Side of Fraser Island Since the 1980's : Fraser Island - Surf Life Saving Queensland have conducted marine stinger drags on Fraser Island. The drags were to look for Irukandji - Hervey Bay resident David Olds has brought his family to the Western side for over 30 years and shares his views on the recent Irukandji concerns. 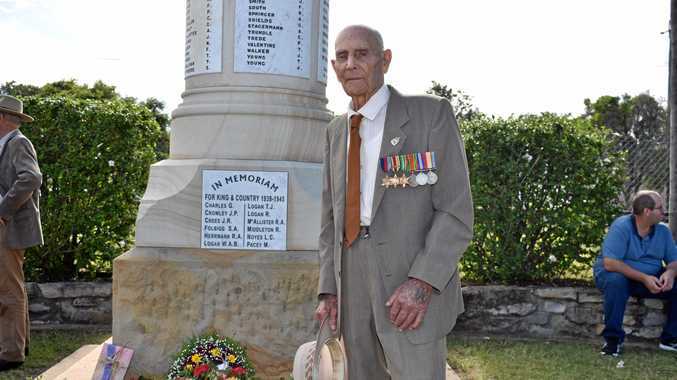 Hervey Bay resident David Olds has been going to Fraser Island regularly with his family for the past 35 years. "I've definitely felt the water getting warmer over the years," he said. "We tend to not swim in the sea because we know that jellyfish are there. "Instead, we stick to the fresh water." The island lover said not even the confirmation of irukandji would stop him going to his favourite tourist stop. "No, no way in the world would we stop," he said. "It's just one of those things you have to live with, like for example, a wet day."